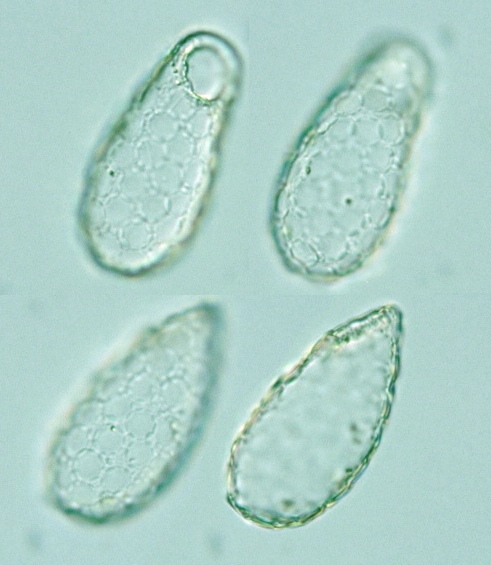 Species: Test puch-shaped, ends round, dorsum arched, ventrum flat or concave; 45-50 μm long, 23-26 μm wide; 22-25 μm high; scales elliptical, overlapping; pseudostome elliptical to round, 8-10 μm, rim invaginated, slightly recuved in (llustrated Guide, 1985). 40-50 μm long (How to know the protozoa, 1979). Test oviform, compressed anteriorly, formed of circular scales; 32-103 μm long, 15-60 μm wide; pseudostome 6-20 μm, scales 4-12 μm in diam. ; nucleus 6-12 μm in diam. (Cash & Wailes, The British Freshwater Rhizopoda and Heliozoa vol. III, 1915). Please click on species name for more images.